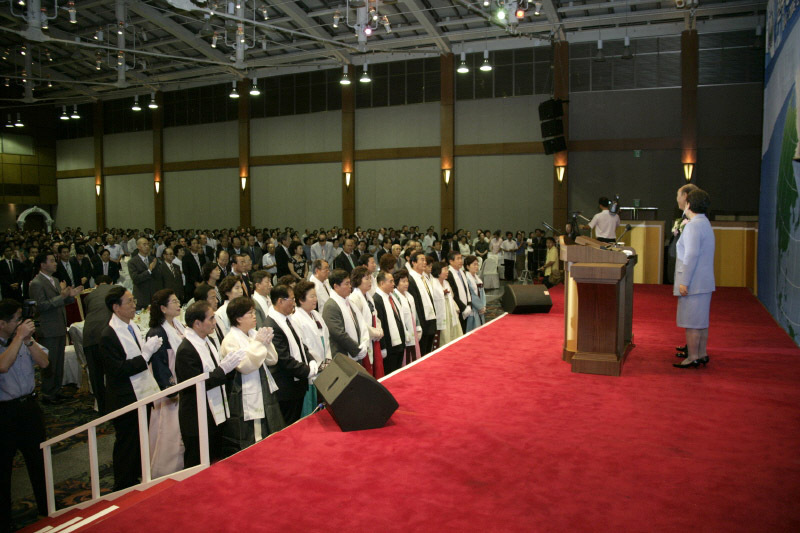 On August 31 at the JW Marriot Hotel, True Father spoke for the "Seoul Rally for the Liberation of the Homeland of Cosmic Peace and the Return of Heaven and Earth to God." 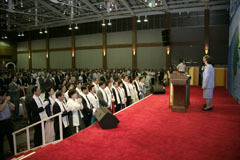 Over 1,000 guests took part in this event, including Dr. Chung Hwang Kwak, chairman of UPF; Rev. 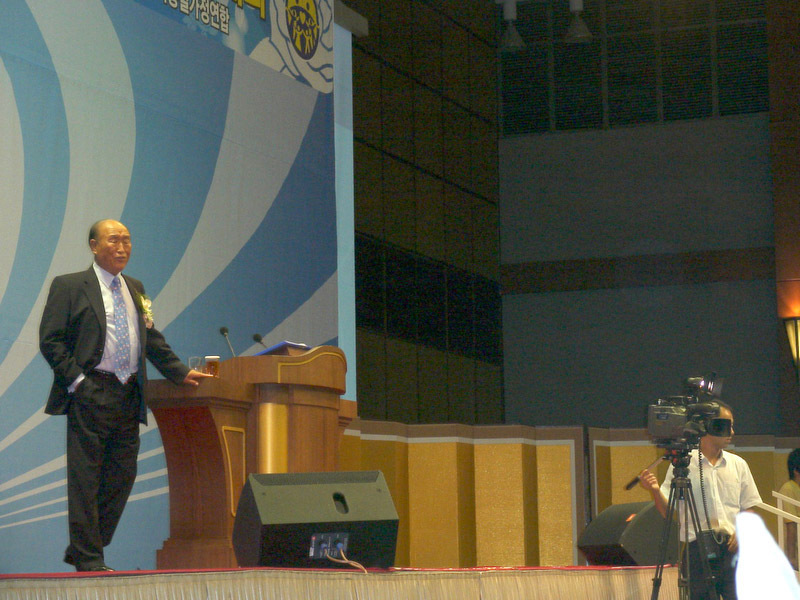 Sun Jo Hwang, president of FFWPU Korea; and Lieutenant General Sun Min Lee of the reserved forces. At the same time, True Parents' message of peace was delivered concurrently in ten other cities of Korea by True Children and grandchildren and their families. In his speech True Father presented a way to prevent and heal interracial, international and interreligious conflict and strife afflicting the global village, saying, "What God detests most are the struggles within humankind." In the Grand Ballroom of the JW Marriot Hotel located in Seoul, Father stated that "this is why the United Nations... today has to admit its innate limitations and confess that it can no longer give hope to humanity" and emphasized that "the Universal Peace Federation will lead the way for the realization of peace which the United Nations has failed to do in terms of the religious and spiritual side of human life." He reiterated that "peace is rooted in the family" and that "world peace begins from an ideal family centered on God." After the speech participants reaffirmed their pledge to preserve the pure lineage, to not fight with their spouses, to educate their children according to the heavenly way, to sacrifice and serve their neighbors through a life lived for the sake of others, and to work for the sake of peace wherever they are and whenever they can. With establishment of the Universal Peace Federation a year ago, True Parents have initiated and engaged in a number of peace initiatives, ranging from the hosting of international, intercultural exchange marriages, the movement for the renewal of the UN, initiating a global ambassadors for peace network, and interfaith activities.